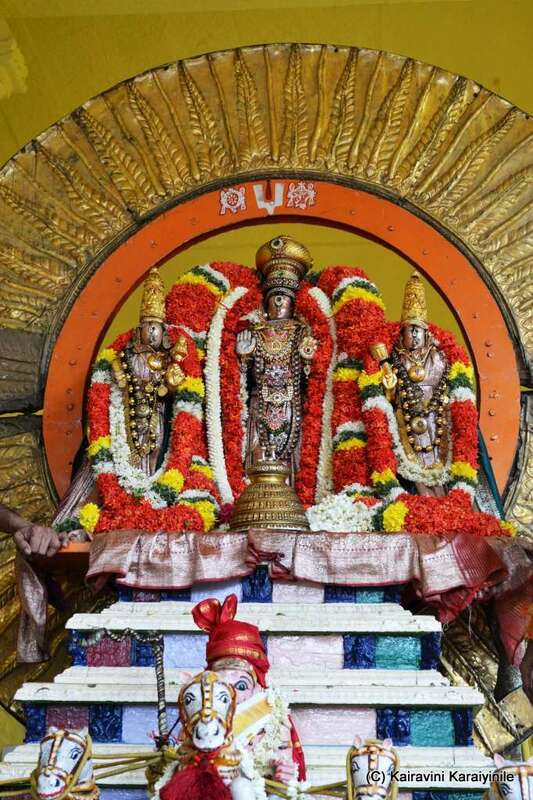 மிருத்யுபயம், கொடியபாவங்கள், கெட்டவிஷயங்களொன்றும் அணுகாமலுமிருக்கத்தக்க உபாயம் யாதுஎனஅறிவீர்களா ? 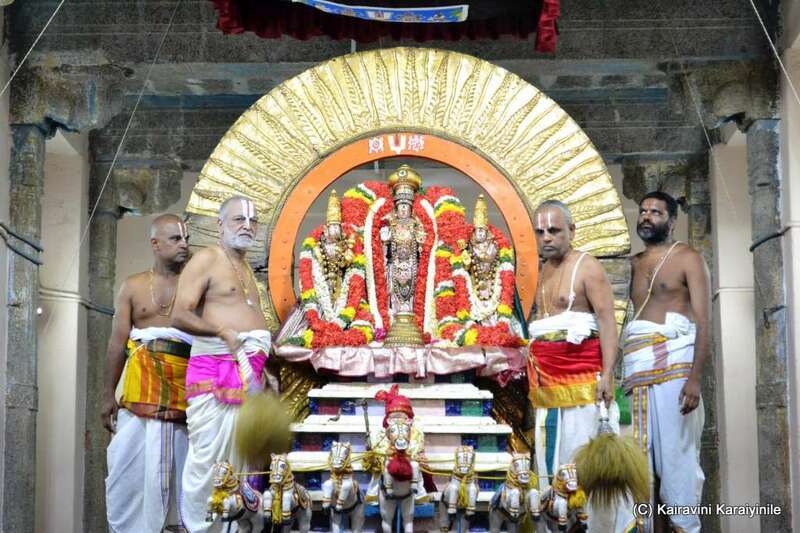 At Thiruvallikkeni, in the grand Brahmothsavam of ThelliyaSingar on day 4 morning it - Surya Prabhai representing the Sun chariot pulled by 7 horses. The radiance of Sun would sure get overshadowed by the brilliance of Perumal. Centuries ago, Thiruvallikkeni was such a pleasant garden with dense vegetation that ThirumangaiAzhwar described it as ‘இரவியின் கதிர்கள் நுழைதல் செய்து அறியா திருவல்லிக்கேணி” ~ the Thiruvallikkeni where the rays of Sun have not ventured inside……today, it is a concrete jungle with so many flats, vehicles and over-crowded that there is not proper space for the Perumalpurappadu – of course in tune with its older leanings, cattle still remain………….day before yesterday, during the evening purappadu, a cow ran amok causing fear among mortals. The Sun god is driven by a seven-horsed Chariot depicting the seven days of the week. Going by Upanishad, their names are :Gayatri, Brhati, Usnik, Jagati, Tristup, Anustup and Pankti. It was such a wonderful darshan to see Lord Narasimha in Suriyaprabhaivahanam. மரணபயம், கொடியபாவங்கள், கெட்டவிஷயங்கள் போன்றவை யாதும் நம்மைஅணுகாமல்இருக்க- புனிதமான திருக்காவேரிக்கரையான கபிஸ்தலத்திலே திருக்கண்வளர்ந்தருள்கிற எம்பெருமானை நமது உள்ளத்தேவைத்து இருத்தலே சரியான உபாயம். Lesser mortals like us need not worry about the future uncertainties, bad things and sins of life – ThirumazhisaiAzhwar shows us the path of having in our hearts – that beautiful Lord Krishna reclining on the riverside of the holy Kaveri, who will protect us all the time. 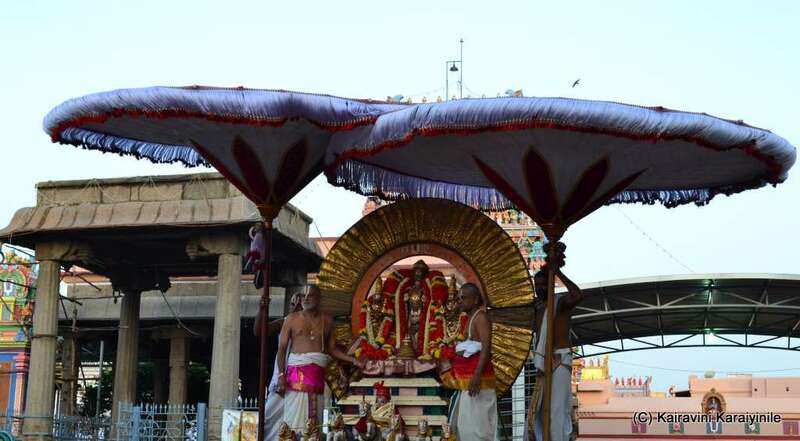 Here are some photos of Lord ThelliyaSingar in Surya prabhai at Thiruvallikkeni. the Varaha Temple at famous Khajuraho !